Tzu Chi volunteers in Brazil held a free clinic in Itaquaquecetuba, São Paulo, on January 20. This was the sixth time the foundation had provided free medical services at the E.E. Vereador Durval Evaristo dos Santos school in Itaquaquecetuba. It was summer break, but many teachers at the school sacrificed some of their vacation time to volunteer at the event. People seeking medical attention formed long lines along the street outside the school. The weather was very warm, but the school had thoughtfully put up canopies at the entrance for people to take shelter from the hot sun. Volunteer Solange was the coordinator of the event. 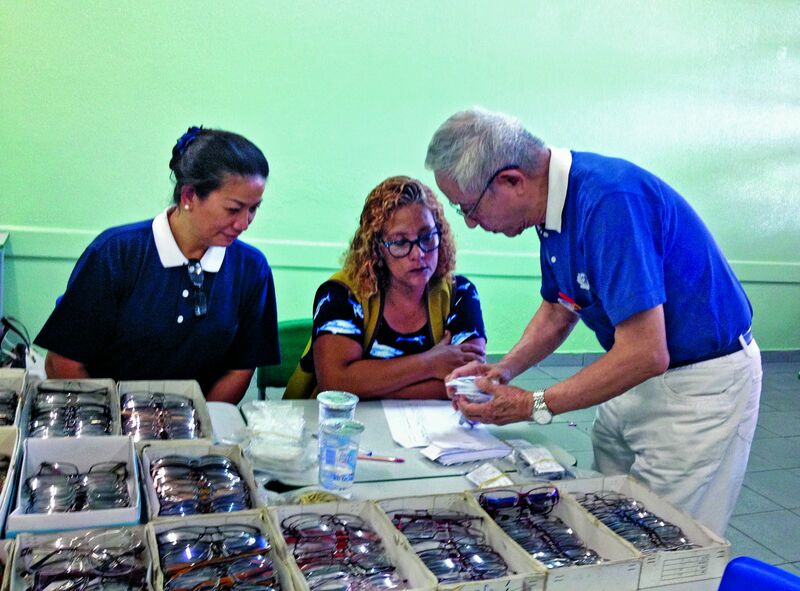 She explained to the patients that registration was taking a longer time on this day because volunteers were screening to prevent people from receiving prescription eyeglasses from Tzu Chi more than once in two years. The precaution was taken to ensure that more needy people could get help. She apologized to the crowd for keeping them waiting. One teacher from Colégio Técnico Paulista brought 12 nursing students to the clinic to serve. Volunteer Nelson Vasconcelos demonstrated to the students how to measure a patient’s blood pressure and blood sugar level. The students were happy to join the event and apply what they had learned at school to serve people in the community. Services in cardiology, ophthalmology, dentistry, internal medicine, OB/GYN, dermatology, and traditional Chinese medicine were offered at the event. Thirteen doctors and 150 other volunteers together served 917 patient visits. It wasn’t just medical professionals that were able to help others at the event. A beautician teacher from Instituto Casa Aberta brought eight hairdressers to serve the public at the event. People were delighted to be groomed by professionals. Volunteer Cai Jin-long (蔡金龍) helped transport medical equipment, so he was the first to show up for the event and the last to leave. There was a lot of equipment to move, some of which was very heavy. He was often drenched in sweat, but he didn’t mind the heavy labor. He was just glad to be a small cog that helped a big machine run smoothly. 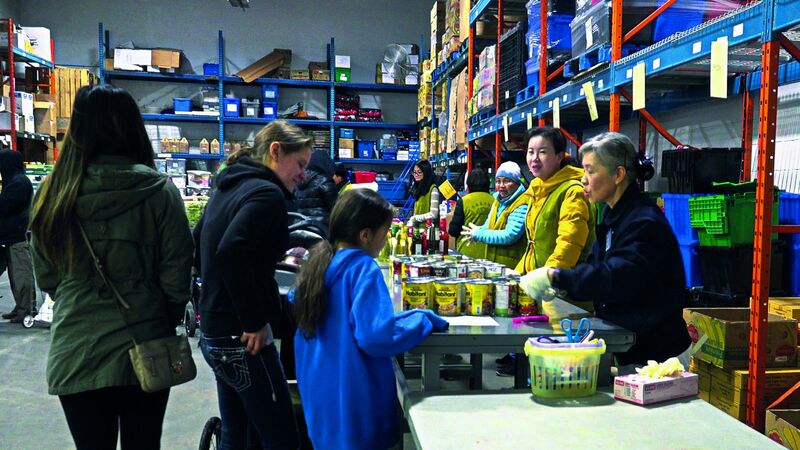 Since 2003, Tzu Chi volunteers in Surrey, British Columbia, have been volunteering at the Surrey Food Bank. Every Wednesday from nine in the morning to one in the afternoon, volunteers assist underprivileged families in packaging and picking up food. Just as important, volunteers extend warmth and care to recipients. In addition to this regular service, the Tzu Chi Surrey office supports the food bank’s Tiny Bundles program with an annual donation of CDN$10,000 (US$7,520). This program helps families with pregnant women and children under one year old by providing them with food, diapers, and other items. Leaf Alifu (阿力夫), for distribution to needy people. A mother and her daughter came to the food bank that day. Because there was a limited number of boots to give out, each family was limited to one pair. However, when volunteers saw that the mother was wearing flip-flops and that it was cold and raining outside, they asked her to pick a pair for herself too. The woman thanked the volunteers profusely for this heartwarming offer. Fu Jia-lin (傅家琳) has been volunteering at the food bank for a while, but every time she serves there, she feels richly rewarded spiritually. She said that few people get a smooth ride all through their lives, and when you are down and out, a helping hand can put you back on your feet. Therefore, she appreciates this opportunity to serve people at the food bank. Although she was tired after being on her feet for four hours straight, she was happy, especially when she saw the smiles on the recipients’ faces. Tzu Chi held seven free clinics from January 10 to 16 in Ecuador. The venues were located in Canoa, Portoviejo, and Santa Ana, in Manabi Province, and Guayaguil, in Guayas Province. The foundation started providing aid in Ecuador after the nation was hit by a major earthquake in April 2016. January to April is the rainy season in Ecuador. The unstable weather posed a challenge to the free clinics, some of which were held outdoors. Thankfully, the construction team for a local church Tzu Chi was helping rebuild set up canopies for shelter in case of rain. On January 10, the first day of the clinics, 42 people from the construction team assembled before six in the morning and began putting up canopies and setting up the venue in Canoa. The free clinic mission was led by William Keh (葛濟捨), MD, CEO of the U.S. Tzu Chi Medical Foundation. Medical professionals from the United States and Ecuador worked together to serve local patients. Dharma Master Zong Chuan, a traditional Chinese medicine doctor from New York, has taken part in Tzu Chi free clinics for years. This January, she volunteered at the free clinics in Ecuador. Anna, a little girl whose leg had been injured in a fall several months before, had had surgery at that time, but she was still in pain. After the Master administered acupuncture to her at the free clinic in Canoa, Anna broke into a smile because her pain had been greatly alleviated. 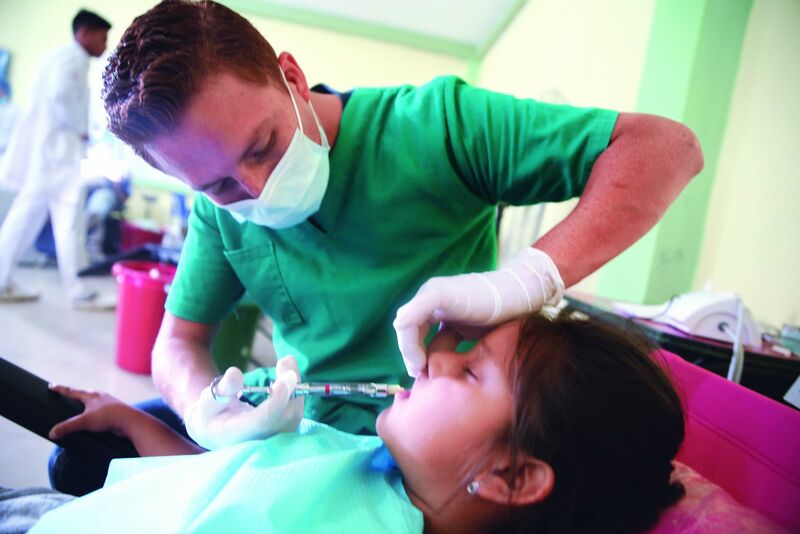 Three professors from the dentistry department at the University San Gregorio de Portoviejo took 11 fourth-year students to volunteer at the free clinics held in Portoviejo and Santa Ana. The professors said that their school encourages students to serve society and participate in free clinics. They thanked Tzu Chi volunteers for giving them this opportunity to work with them to serve local people. Aside from services in family medicine, pediatrics, dentistry, and traditional Chinese medicine, people could be fitted for prescription glasses at the events. This service was important to some local people because they were too poor to afford prescription glasses and had had to live with blurry vision. The seven free clinics served more than 3,900 patient visits. After the events concluded, volunteers headed home with a sense of fulfillment for having contributed what they could to serve those in need. Over 30 Tzu Chi volunteers from 11 countries visited five refugee camps in Serbia from January 10 to 14. They held five distributions, four blessing ceremonies, and three hygiene education classes for children. Serbia is located on a major refugee migration route from the Middle East to Europe. The route was shut down in 2016, leaving many refugees stuck in Serbia. Tzu Chi volunteers in Europe have extended care to refugees there since 2016. Many refugees do not have enough clothes to keep them warm during cold weather. They were forced to flee their countries because of war or religious persecution, and so they have nothing that they couldn’t carry during their escape. Sometimes all they have are the clothes on their backs. During their visit in January, Tzu Chi volunteers distributed 3,325 sets of winter clothes and thermal underwear. Some refugees changed into new clothes as soon as they got them. Noor, 10, is from Afghanistan. His family of eight fled to Serbia two and a half years ago. Telling volunteers the story of their escape still visibly upset him. He said that while on the road they had been chased by police, gone hungry in the woods, and forced to sleep unprotected on the cold, wet ground. He thanked Tzu Chi volunteers for giving him and other children school supplies, book bags, winter clothes, toothbrushes and toothpaste. He was also grateful that Tzu Chi had arranged hygiene education for children in which they were taught how to properly brush and protect their teeth. Despite having gone through a lot during his escape, Noor harbored no ill feelings in his heart. He said he hoped he could help others when he grew up. Even though he was chased by police during his escape, he wanted to become a policeman so he could help people in need. Gheisar is an architect from Iran. His family of four was forced to flee their country for survival because they weren’t Muslims. He said that this winter had been very cold, and they didn’t have winter clothes with them because it was summer when they fled their country. He was therefore full of gratitude to Tzu Chi volunteers for bringing them warm clothes. Djurdja Šurlan, manager of the Krnjača camp, said that the camp had been blanketed in snow for the past 10 days, and the temperature had dropped to -10 degrees Celsius (14 degrees Fahrenheit). She extended appreciation to Tzu Chi for the clothing, which will help refugees pass this cold winter. 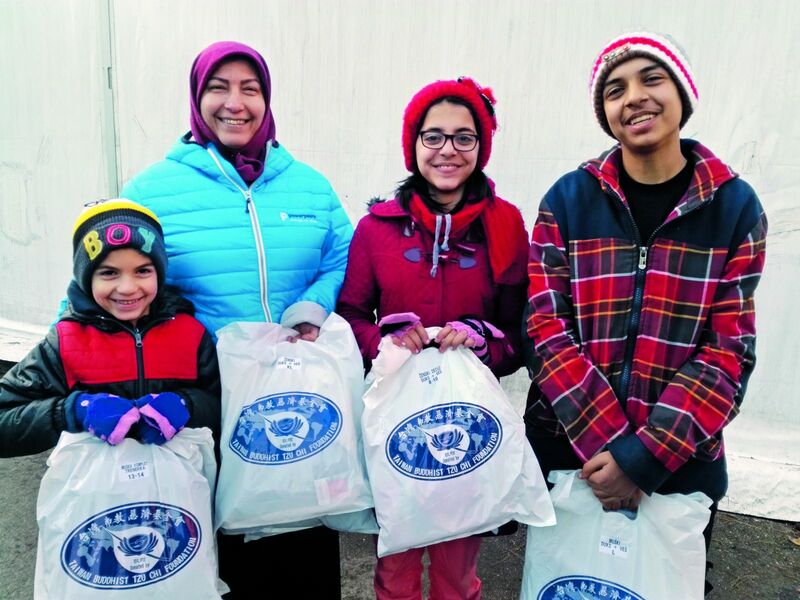 In 2018 alone, the Tzu Chi Foundation provided in Serbia over 1,249,000 servings of bread to refugees, one-year’s worth of school supplies to 536 refugee children, and summer clothing to 2,990 refugees. Volunteers will continue to help refugees through this difficult time in their lives with material aid and sincere love.